Everyone knows about making crystals grow on pipe cleaner shapes. We wanted to try something different and made a crystallized pinecone. 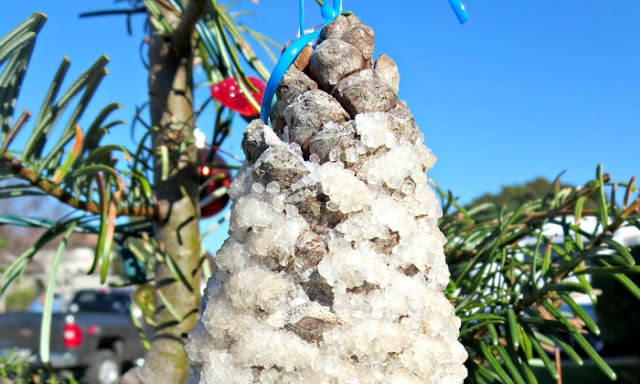 Here is a tutorial on how to make a “frozen” crystal pinecone. 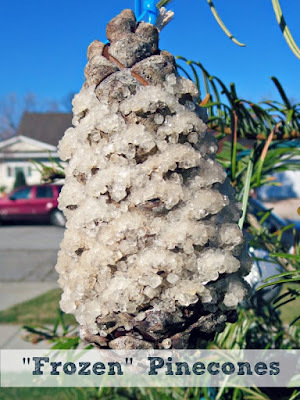 I looked up the instructions for crystal pinecones on the Internet, and the recommendation was to “seed” pinecones by spraying them with adhesive spray and sprinkling them with Borax first. I wanted to experiment and see if there is a difference between a “seeded” pinecone and plain pinecone. A "seeded' pinecone dried for 24 hours before the next step. Dissolve Borax in boiling water until the water remains cloudy after stirring. For us it took about 1.5 cups of Borax per 2.5 cups of boiling water. Pour water into containers and dunk your pinecones. This is the hardest part, since we discovered that those stubborn cones really wanted to get back up (a mini lesson in buoyancy right there). Eventually we tied them to wooden dowels and secured the dowels with electrical tape to keep them submerged. We set our pinecones in the garage (the smell of borax and wet pinecones is not exactly pleasant) and waited for 36 hours before retrieving them and hanging them to dry. The crystals formed equally well on a seeded and non-seeded pinecone, so I’d recommend skipping the seeding step entirely, especially if your pinecone is not very smooth. The crystals are quite brittle and toxic, so you might want to cover them with varnish or Mod Podge if you plan to keep your pinecones. Make sure your children know that this is not sugar, and keep them away from pets. Hang Your "Frozen” Pinecones Up! We chose to put ours outside, but these "frozen" pinecones will make a great winter decoration for inside as well. It would be fun to make these pinecones with real ice too, but we hardly ever get below freezing and then usually only in the middle of the night. Does it ever get cold enough where you live to make real frozen pinecones? This is really neat, and I have never seen anything like it! Very cool! This is such a great twist on the Borax crystal project!! Your end result does look a lot like a frozen pine cone. I like the variation from the same old same old, too - very nice idea! What a cool idea! A science experiment that you can use for decoration afterwards! Genius! Oh how nice! I love it! What a cool idea! My son has a ton of pine cones he has gathered from our nature walks that are just dying for a project. Thanks for participating in the #kidcraftchallenge.